Giving new meaning to the term " Football Jumper " , another former Brisbane Broncos, star NRL player , has signed up to join the national AFL Competition in 2011. Both Israel Folau and Karmichael Hunt have signed to play for Greater West Sydney and the Gold Coast respectively. Hunt will finish his season with French rugby union in 2010 with Top 14 side Biarritz Olympique. Young, dynamic and talented , the AFL's newest recruits will be used by the AFL as ambassadors to promote the Game . Will these two " football jumpers ' , be able to successfully switch codes to play Australian Rules Football from playing National Rugby League ? Fans will be out to cheer the ' new boys', in their new teams , wearing their football jumpers , jerseys , guernseys. 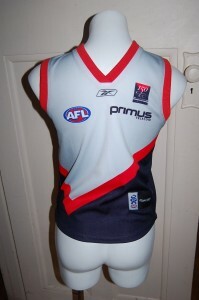 This entry was posted on Wednesday, June 2nd, 2010 at 10:14 am	and is filed under AFL, football jumpers. You can follow any responses to this entry through the RSS 2.0 feed. Both comments and pings are currently closed.